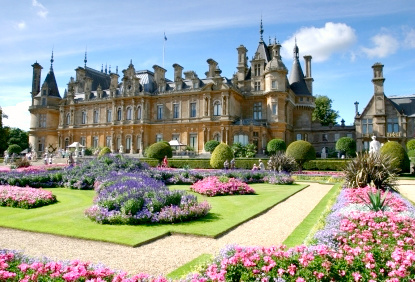 The sumptuous Waddesdon Manor should be on top of your list of places to visit in England. It is one of the grandest palaces in Britain, be it for its marvellous art collection, its lavish French gardens or its imposing architecture. Waddesdon Manor was commissioned by Baron Ferdinand de Rothschild to house his art collections and constructed between 1874 and 1889 in the style of a French 16th-century Renaissance château. It now houses one of the finest art collection in the world, which includes French 18th-century furniture, Sèvres porcelain, Savonnerie carpets, portraits by Gainsborough, Reynolds, Dutch and Flemish masters, Renaissance works. The manor's shop sells Rothschild wines from around the world, including the celebrated Château Lafite-Rothschild and Château Mouton-Rothschild, as well as wine-related gifts and books. The grounds of the manor (gardens, aviary, restaurant and shops) are open Wednesday to Sunday (and public holidays) from 23 March to 6 November. Admission to the grounds only is £10 for adults and £5 for children aged 5 to 16 years old. The house can be visited from 10 am to 5 pm Wednesday to Sunday from 23 March to 23 October. A combined ticket for the House & grounds costs £20 for adults and £10 for children aged 5 to 16 years old. The House and grounds are also open a few days before Christmas (check the official website for exact dates). 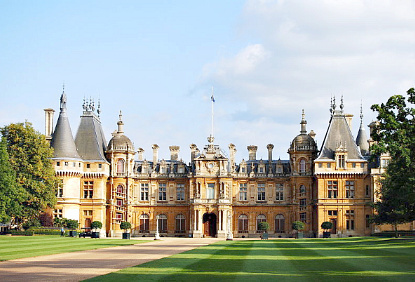 Waddesdon Manor is 10 km (6 mi) north-west of Aylesbury, Buckinghamshire's county town. Aylesbury is just one hour by train from London's Marylebone station (£17). From there, take bus No 16 or 17 to Waddesdon Manor (15 min). By car, Waddesdon is on the A41 between Aylesbury and Bicester. It is about 20min from the M40's junction 7 (coming from the south) or 9 (coming from the north).